Remarkably few musicians achieve iconic status, their reputation often clouded by extra-curricular considerations. Glenn Gould’s eccentricity, for example, can distort an objective assessment of his contradictory art and, regarding those of a more temporary status, Eileen Joyce’s glamour or the publicity surounding Van Cliburn’s triumph in the inaugural Tchaikovsky Piano Competition have masked assessments of their true calibre. Stephen Kovacevich feels that Dame Myra Hess acquired a comfortable Queen Mother status and regality that, while appealing to Americans in particular, compromised estimates of her stature. But with Arthur Rubinstein (1887-1982) there is no such sense of diversion. How vividly I recall my parents’ present of a children’s encyclopedia where I came across a picture of Rubinstein and the statement ‘When Rubinstein plays Chopin, you are carried away into another world’; heady and alluring stuff for a 10-year-old and an aspiring young pianist. Of course, there was image as well as musical reality. An engaging raconteur, Rubinstein was perhaps over-fond of regaling the press with such statements as ‘I am the happiest man I know’ or ‘I adore Spain as I adore a woman, with tenderness’. Talking to me many years ago, he confessed to a special love for Chopin’s Barcarolle, claiming that after his performance he invariably succeeded in seducing the most beautiful woman in the room. True, Harvey Sachs’s biography tells of a man susceptible to jealousy (Horowitz’s success was a particular irritant, thus ‘he may have possessed a great technique but I was the finer musician’) and with a less than immaculate pedigree as a husband and father. But the playing – the musical truth – is where you strike gold. You may miss recordings of music intimately associated with Rubinstein: Albéniz’s Iberia, Szymanowski’s Second Sonata andStravinsky’s Petrushka failed to materialise. Was it because he offered a ‘helping hand’ to composers, who would have complained that he did not play what they wrote, even when he made their writing more scintillating than the original? And you will note the absence of lateBeethoven. Once a champion of the Hammerklavier Sonata, Rubinstein later felt that the great middle-period sonatas (theWaldstein and Appassionata) were more to the public taste. But he recorded virtually all of Chopin, and even though his plans for the complete Etudes were never realised, his sets of the Mazurkas, Polonaises, Nocturnes and Scherzos of 1932‑39 are beyond price, a legacy where patrician elegance combines with a heroic virtuosity – and an endearing touch of recklessness – to confirm Rubinstein as arguably the greatest of all Chopin pianists. He may have revisited these masterpieces on record throughout his life, seeking an ever-greater clarity and refinement, yet today we can listen to first offerings that were the antithesis of a more sentimental tradition. Chopin was a force of nature for Rubinstein, a man of fire and ice, a fellow patriot who wrote the tragic history of Poland in music. Rubinstein brought vigour and energy and a unique tonal elegance and finesse to every teeming page and idea. His way with the Mazurkas (Chopin’s confessional diary) allows for a give-and-take, a rubato (or musical breathing) that illuminates every harmonic and rhythmic twist and piquancy. And here is Rubinstein the great ‘singer’ pianist – enough to arouse envy in Callas or Fischer-Dieskau. Puzzled by, say, Richter’s ‘Chinese water-torture’ tempi in Schubert or Argerich’s crazed volatility in Chopin, he sought a perfect balance of sense and sensibility, a flawless combination of Slavic passion and Gallic precision. And, above all, there was his charisma, ensnaring the far reaches of his audience and drawing everyone into his magical aura. Few pianists have aroused their listeners to such a fever pitch as they wait for their favourite encores (Chopin’s Nocturne in F sharp; Falla’s ‘Ritual Fire Dance’, with hands flailing like a threshing machine; or Villa-Lobos’s ‘Polichinelle’). Rubinstein chose an all-Chopin programme for his long-delayed return to Russia in 1964. He caused a furore, expecially in the heroics of the A flat Polonaise, storming through the coda in a blaze of exultancy. 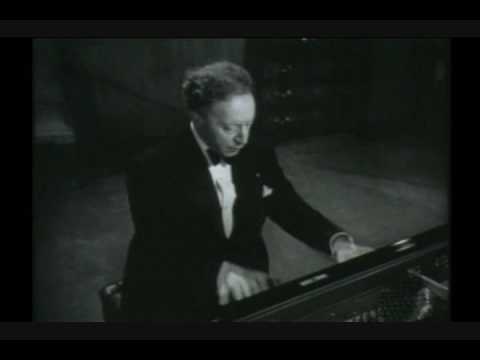 But my closing memory is of Rubinstein’s final recital, given at London’s Wigmore Hall, where failing eyesight and physical infirmity seemingly left him in a performance of his encore, the C sharp minor Waltz. He often lamented a lack of joie de vivre in today’s pianists, an obsession with the letter rather than the spirit of the score. In contrast, his career was a lifelong love affair with audiences, who responsed in rapture. His ‘voice’, verve, charm and idiosyncrasy, his indelible sound and phraseology will remain with us forever, the stuff of legends and of true iconic glory.